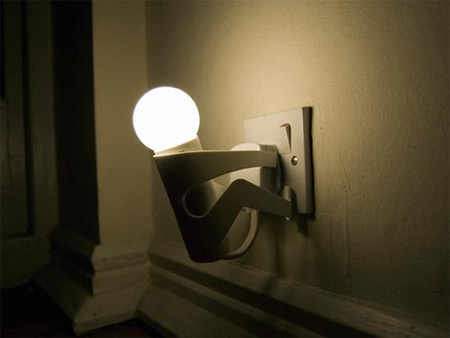 Collection of creative and unusual lamp designs from around the world. 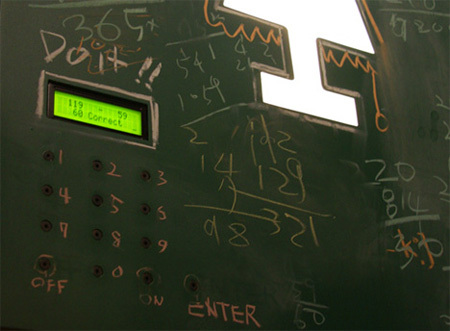 To turn it on, you have to solve a randomly generated math problem. Don’t fret, it’s set on chalkboard for the numerically challenged. 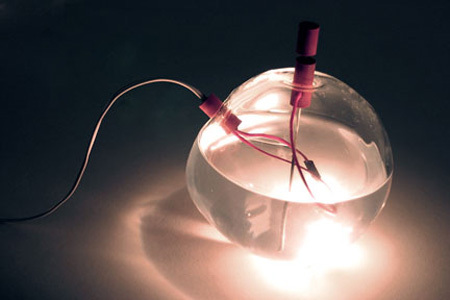 The WET Lamp is an elegant and playful series of glass lamps with an alluring water-submerged light bulb at its center. 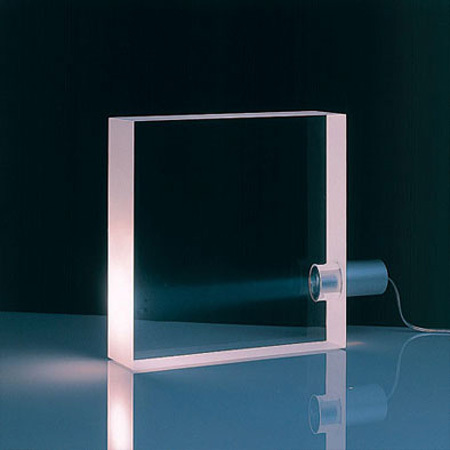 When a thin silver rod is slid into the water, the WET Lamp turns on and becomes progressively brighter as the rod is submerged. Lamp and magazine-stand in one. 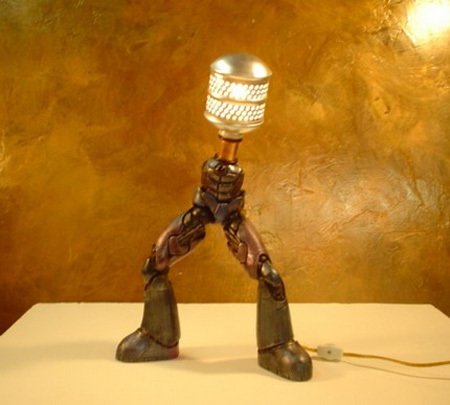 Made from a salvaged broken robot action figure, sprinkler head and lamp kit. 16″ tall. All salvaged parts are washed with antibacterial cleaner. 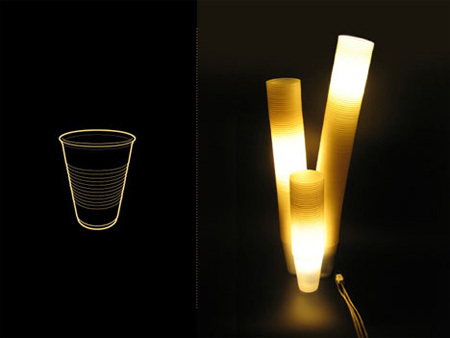 Lamp made out of drinking cups by Peter Castellucci. Tofu is simplicity at its best: an aluminum lightsource is all that mars its otherwise simple and clean design, made with a delicate cutting process that would make its gastronomic brethren proud. 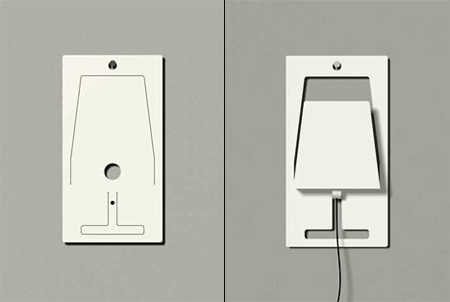 Designed by UK design studio The Play Coalition, made from stainless steel, the playful lamp hangs from a plug point. 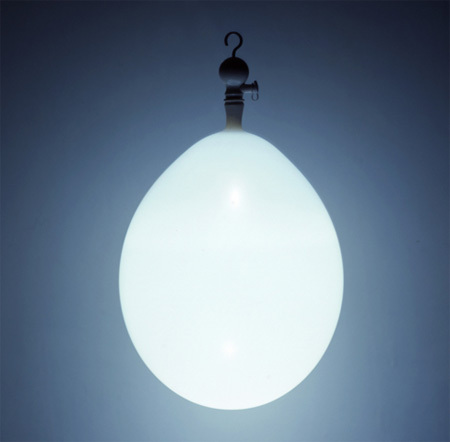 Balloon lamp is made from a regular balloon, lithium coin battery, and LEDs. The LED generates no heat, provides high intensity light, and lasts for over 100 hours on two batteries. Tall and Tiny are two Vinyl sticker-lamps by Alice Rosignoli. 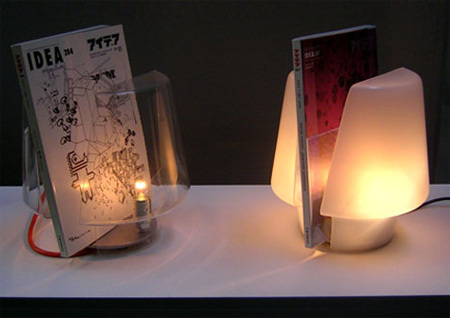 The shape of Tall remind of a large living-room lamp and the shape of Tiny of a small bedside lamp. 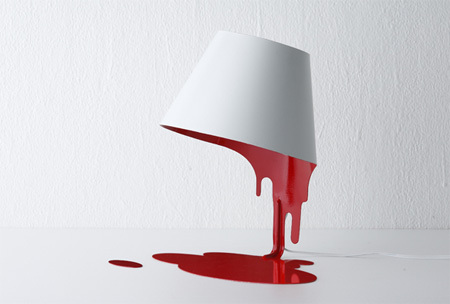 A lamp which appears to be flowing liquid. “Lamp Chop Light” by Jeth Koh foldable lamp made form a single sheet of metal. Able to hang from a wall or stand all on its own, this lamp is sure to NOT stand-out from the rest. 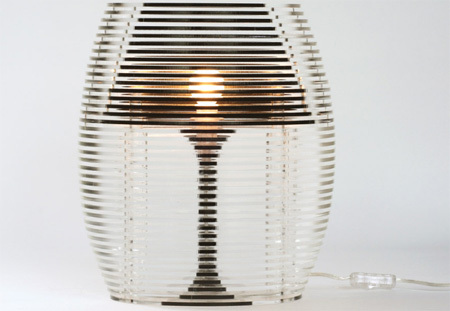 The Light Blubs are a series of crystal lamps, designed by Pieke Bergmans, in cooperation with Royal Crystal Leerdam. The lamps are all unique handcrafted crystal pieces, equipped with leds by Solid Lighting Design. Body made of a two-part fiberglass mold- white lacquer finish. 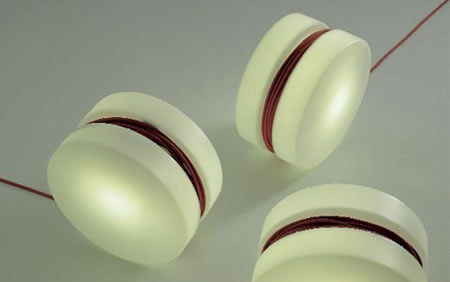 Light covers made of Corian. Legs 5/8” hollow steel tubes each curve is unique to its location- white powder coat finish. 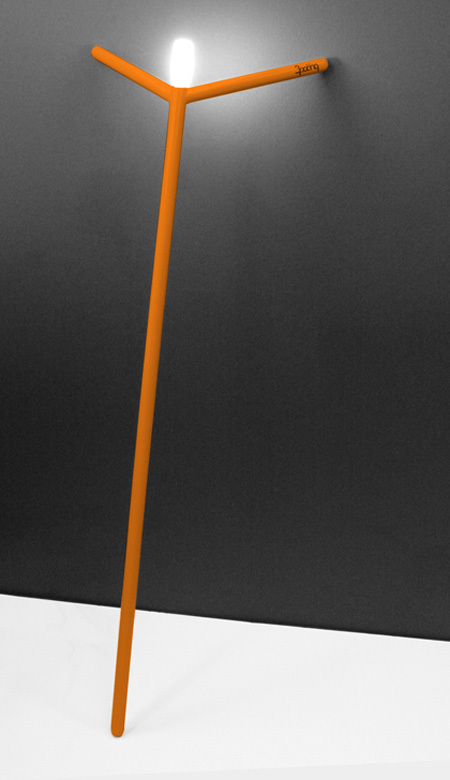 Without the static foot this lamp invites you to grab it and move it where you need light the most. 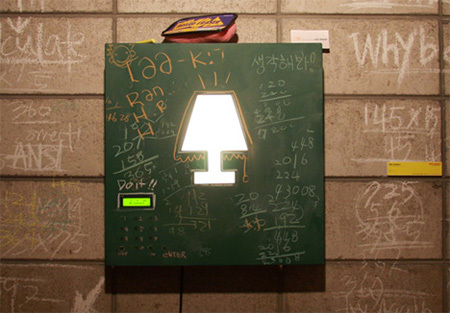 It can be used as a “floor stand” lamp that leans against the wall, in a corner or simply flat on the floor. 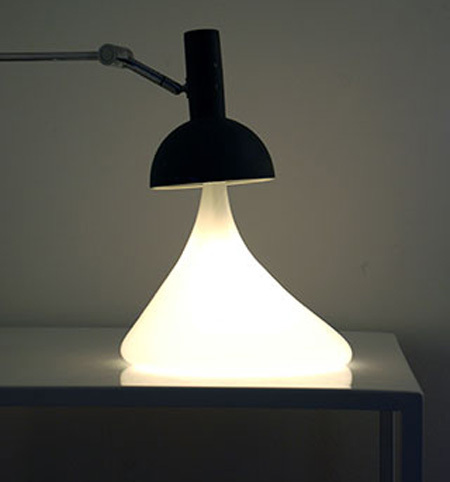 Rubber at the 3 touch points prevents the lamp from falling. 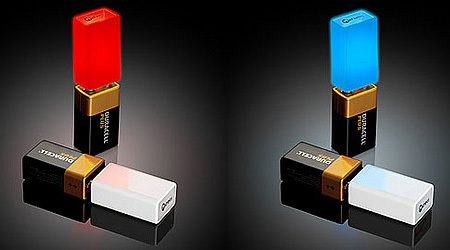 Think of it as an exact replica of a 9-Volt battery made out of high powered LED’s. All you do is plug it onto the 9-Volt battery and voila, you have a modern day version of a candle. Studio Mango created the Sliced lamp by cutting up an old fashioned table lamp and inserting more than 40 perspex plates in between the slices. The black fabric covered shade supplied is a reflective gold on the inside to enhance Teddy’s golden features and his plump body enables you to park him where you please without fear of him toppling over. Wow, amazing lamps. Thanks for sharing. Great lamps & lights! Neat post! woah!!! amazing!!! 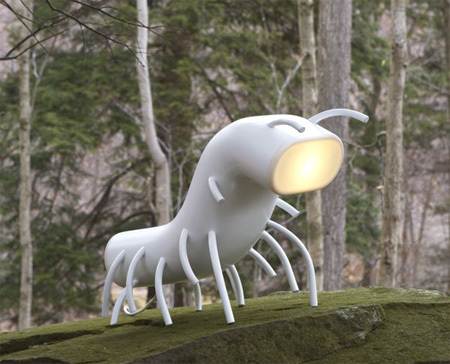 love the Nymph Lamp! Art pieces are always fun to see and to have around the house. In addition, adding function to them is really cool. 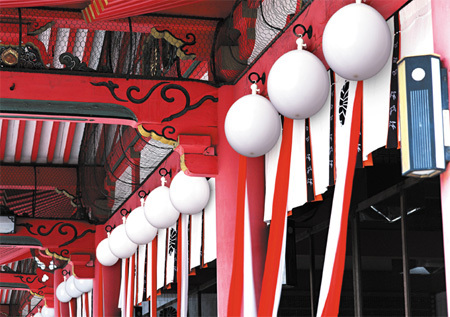 Thanks for sharing these great lamps with us. my favourite lamp is Martyr Lamp and that is great..! I like the wet lamp. It’s a shame that some of the links are broken…. some of these would be perfect in my little house! 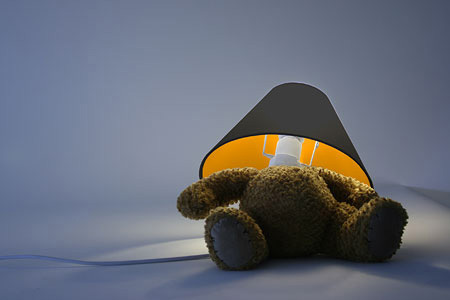 i love Teddy Bear Lamp, Liquid Lamp, Martyr Lamp!!! Wowoooooooooooo…. Where can I get This Lamps?????? Awesome cool lamps love the Martyr and the sliced lamps there cool! Thank You so much for this amazing brain storm!!!!! I absolutely love the Martyr lamp. Such a cute night light. Funny and clever. I like 9 Volts lamp but it wastes of energy. right? Really inspiring stuff! and such great ideas!